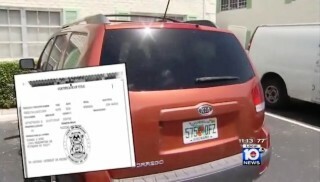 FORT LAUDERDALE, Fla. - Ed Ryan, a long-time condominium president in Fort Lauderdale, has been violating the law for years by paying himself tens of thousands of dollars -- and even buying himself a car -- out of neighborhood funds, according to state records. In September, the Department of Business and Professional Regulation alleged Ryan was illegally managing the association without a license and issued a cease and desist order to stop him from paying himself after he'd received $45,000 in the first nine months of the year alone. But Ryan, president of Georgian Court North Apartments, hasn't missed a beat, admitting to Local 10 News that he's still paying himself. "That was all done with board approval and the association approval," said Ryan. The state during its investigation also alleged that Ryan has failed to turn over some condo documents and altered records, including board meeting minutes to indicate approval for his pay. Resident Iva Steed filed a complaint against Ryan with the DBPR, but she's just one of several residents who are demanding that Ryan stop paying himself and step down as president of the board. "Quit paying yourself you are not licensed and in the state of Florida that is a criminal act," said Steed. Steed learned last year that Ryan in 2010 had purchased a 2009 Kia station wagon for $22,000 at his other home in Michigan under his own name but had used association funds. She filed a police report alleging embezzlement, but the Fort Lauderdale Police Department determined it was civil in nature when the board indicated it approved of the purchase, which the state has found was purchased at least partially for personal use. "I can't possibly figure how that could possibly be allowed under Florida law," said attorney Eric Glazer, a condo expert with no connection to Georgian Court North. "It makes no sense whatsoever." 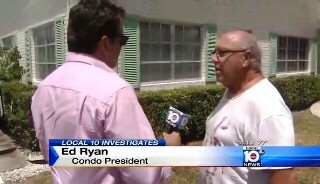 Steed and other residents told Local 10 that Ryan and his group of supporters bully them. Local 10 reporter Bob Norman appears to have seen this first-hand when Seamon "Jake" McGrath, one of Ryan's cohorts, slammed the condo office door on him in violent fashion during one of his visits there. McGrath was accused late last year of assaulting one of Ryan's critics, Howard Kainer, in the condo laundry room. Kainer filed a complaint with the Fort Lauderdale Police Department, alleging that McGrath had attacked and punched him. McGrath admitted as much but claimed he believed Kainer was coming at him first. No charges were filed by the state attorney's office. "It's about power," said resident Hildra Tague, whose son is Kainer's married partner. "They're trying to make us afraid." State regulators have turned the Ryan case over to the state attorney's office for possible criminal prosecution. State attorney spokesman Ron Ishoy said the agency is now reviewing it. Georgian North attorneys, hired by Ryan, said they are fighting all the allegations and claim Ryan has the support of the majority of the board.